SPAGHETTI DINNER AND BAHA’I FUNDRAISER! The Event: A three-course dinner, complete with friends to break the second day of the 19-Day Fast. Price: $20 per Baha’i attendee or donations. All proceeds will be sent to the National Baha’i Fund. Whats on the menu? Spaghetti and meatballs, salad, and dessert. 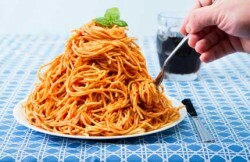 Please RSVP to the Baha’is of Arlington, Virginia (Subject: Spaghetti fundraiser RSVP) in order that we may best gauge our food preparations without a lot of waste. Part of being a world citizen is the ability to educate yourself and apply that acquired knowledge toward the betterment of the human condition. If our basic needs for liberty and the pursuit of education are systematically hindered, we become stagnant and debase ourselves for selfish gain. 1) Contact your government representative(s) and strongly encourage them to condemn any and all institutions who actively suppress the human right to an education. 2) Become a part of an initiative focused on the education of all people. Need help with the first two items in this list? Contact the Baha’is of Arlington, Virginia. Baha’is celebrate the festival of Ayyam-i-Ha each year from sunset on Feb. 25 to sunset of March 1 as a preparation for the Fast, which begins March 2 and ends March 20. 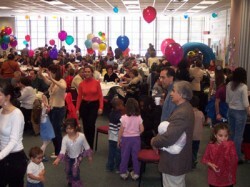 During Ayyam-i-Ha, members of the Faith perform acts of charity, give gifts to friends and family, and attend social gatherings. Want to share in this joyous occasion of love, laughter, and happiness later this month ? Contact the Baha’is of Arlington here. Taking to heart the call by the Universal House of Justice to engage in community-building activities around the world, Zitta Rezvani is a Baha’i here in Arlington who has somehow managed to squeeze volunteer work with the Boys & Girls Clubs of Greater Washington into her busy schedule. “I’ve been doing this for the past 5 years. I was one of the founders of the Next Generation Leaders, which is a liaison between the big board and the boys and girls club clubhouses. Want to get involved? Contact Zitta.